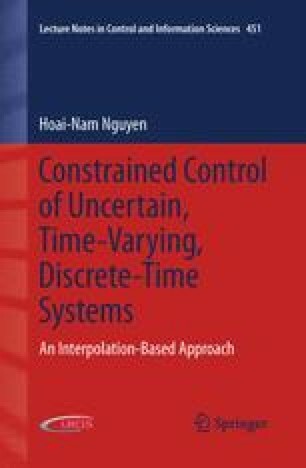 In this chapter, the problem of regulating a constrained uncertain and/or time-varying linear discrete-time system to the origin subject to bounded disturbances is addressed. The robust counterpart of the interpolation technique generalizes the results presented in the previous chapter, recursive feasibility and robustly asymptotic stability being preserved. In the implicit case, depending on the shape of invariant sets, i.e. polyhedral or ellipsoidal, and depending on the objective functions, i.e. linear or quadratic, at most two LPs or one QP or one LMI problems are solved on-line at each time instant. In the explicit case, the control law is shown to be a piecewise affine function of state.